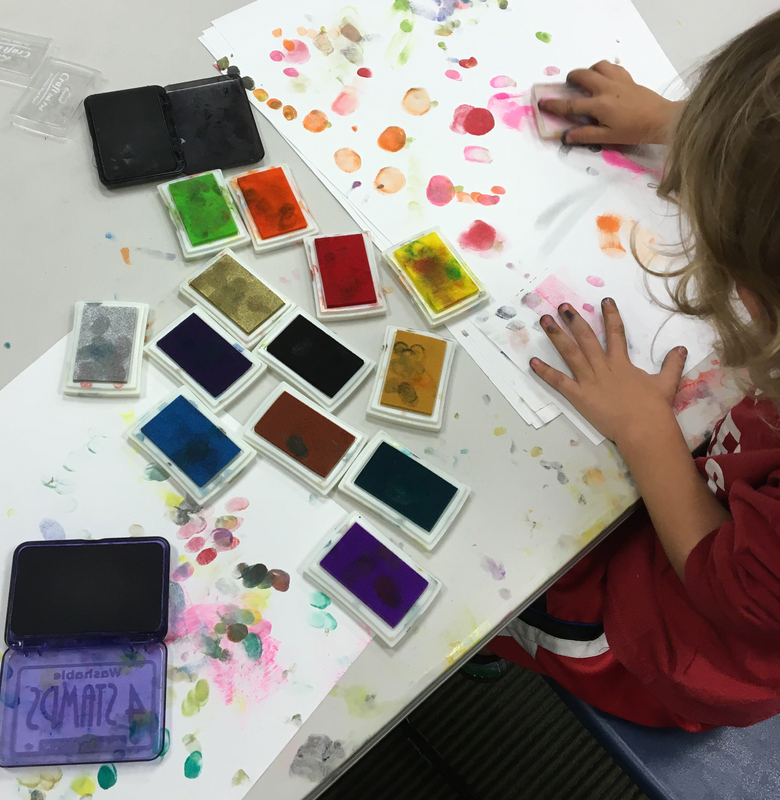 Maker programs for the preschool crowd look a lot like other kinds of programs that children’s librarians have been doing for years, including art programs, science programs and hands-on exploration programs. And with just a few different ways of thinking about and framing an activity, making with littles can be easy! 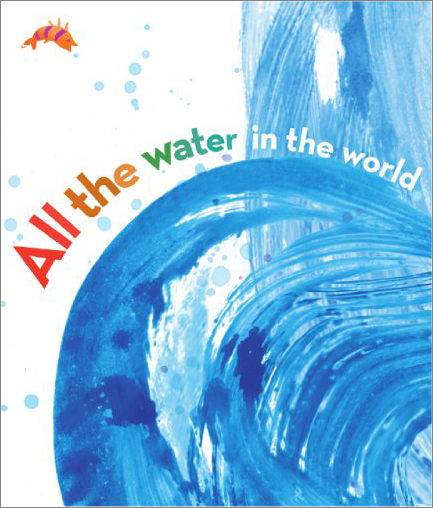 In my maker programs I always start with either an idea for a theme (such as water play) or a book (like Mix It Up! by Hervé Tullet) and add on from there. I look for picture books that I can somehow relate to an art or STEM project, then think of an open-ended activity that will let the kids explore on their own with minimal grown-up intervention, and then identify new vocabulary words that I can share with kids. I also always think about a grown-up challenge, such as reminding caregivers to step back and let the kids explore on their own, or at the very least, guide children by asking open-ended questions. Prep by taping paper to the edge of the table so each sheet of paper is hanging vertically, with your tarp laid out below to catch drips. 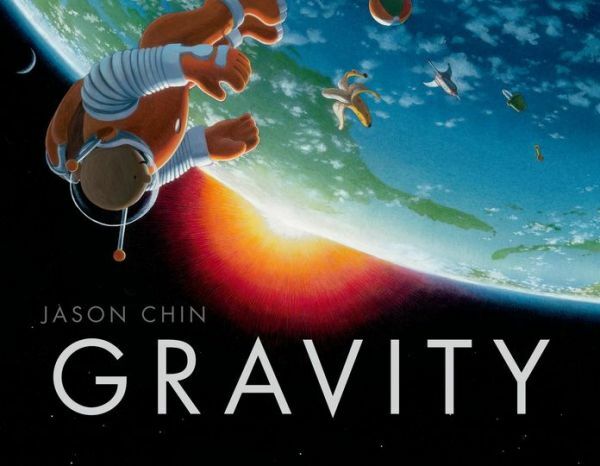 Read the book aloud to the group, and talk about gravity. Ask kids what will happen if they drop something from high up. Then ask, why do you think that will happen? Explain the project, and challenge the grown-ups to sit back and observe and let the kids figure it out. 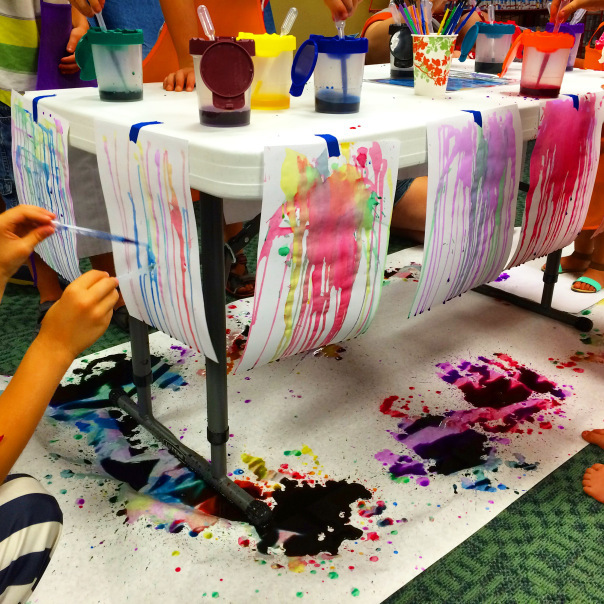 Kids can use the pipettes (or paintbrushes) to drop watercolor paint at the top of their pages and watch it drip down and mix. Bonus tip for parents: using the pipettes will help kids strengthen finger muscles and work on fine motor skills! 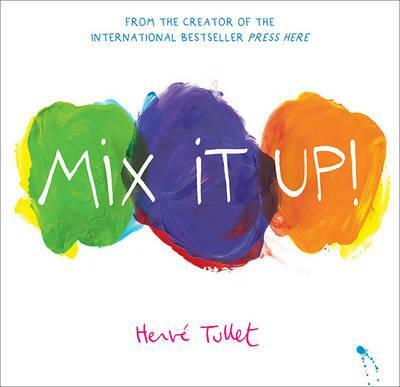 After reading the book, explain to parents that kids are going to do their own mixing and get messy! They will also be working on fine motor skills, which will help when they learn how to write later on. 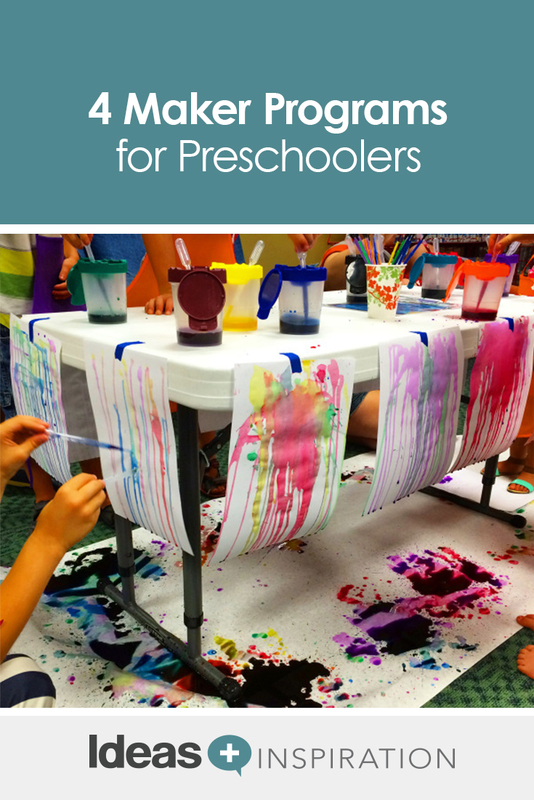 Let kids use stamp pads and fingers and hands in any way to create art. Grown-ups should step back, watch and really let kids explore on their own without trying to direct them. 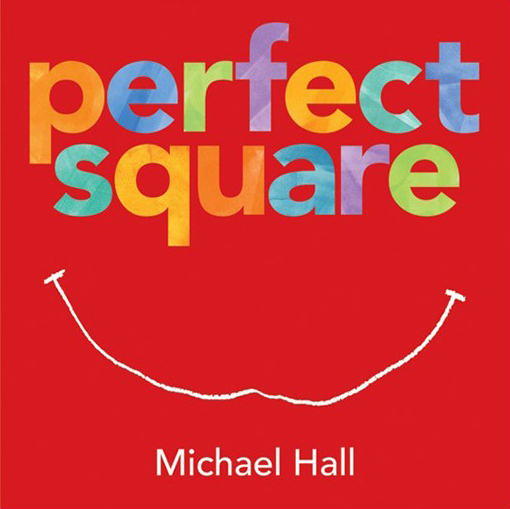 After reading the book, demonstrate crumpling and ripping an origami square and putting the pieces together in a new way. 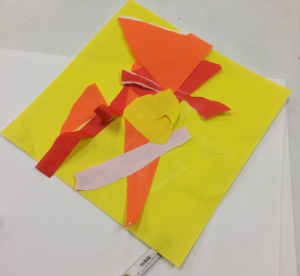 Let each kid use his or her own origami square to make something new. Kids should explain what they have made to their grown-ups and/or other kids. When the paper stands in for a real object, kids are learning about using one thing to represent another, just as words represent real-world items in books. Explain to the parents that kids are working on fine motor skills as they manipulate the paper, as well as challenging their creative imaginations. 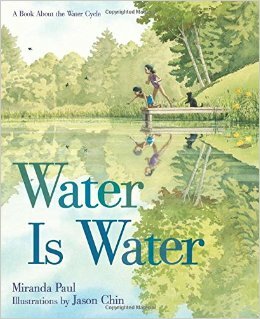 After reading the book, talk about where kids see and use water in their lives (to drink, in the bath, when we wash our hands, outside in rivers/lakes/puddles, when it rains) and properties of water (it is wet, doesn’t hold a form). 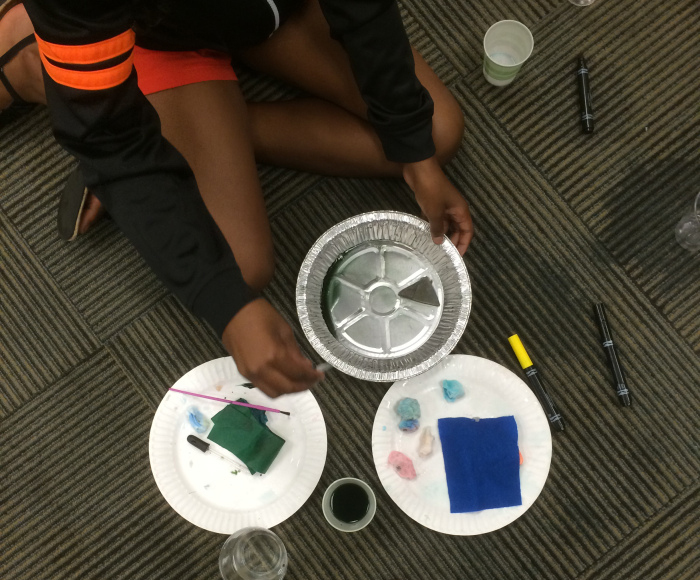 Talk about the idea of absorption and challenge the kids to explore how water reacts with different materials and in different ways. Ask kids what happens if they spill water on their clothes (the clothes get wet) and then what happens if they spill water on a plate (it stays on the plate). Challenge grown-ups to prompt hypotheses and observations from their kids as they are exploring by asking, “What do you think will happen?” “Tell me what you see happening,” “Where is the water going?” etc. In addition to working on fine motor skills, kids are also learning about the scientific process.